It was a beautiful Saturday morning on July 30th, 2016. Mr. Granger Wong Jr. was fishing with his family aboard the charter boat Ohana (http://www.ohanasportfishing.com/) from Kailua-Kona, Hawaii. While fishing the deep pelagic waters just offshore of the big island of Hawaii, Mr. Granger hooked up with a nice Pacific Blue Marlin (Makaira mazara). After a 15-minute fight, they brought the marlin alongside the boat to tag it. The Blue Marlin was named Granger (Tag ID: GFR5338) had an estimated length of 83 inches (210.82 cm) at the time of release. That Blue Marlin was recaptured just 7 days later on August 5th, 2016 by Captain Chuck Wigzell while fishing on his charter boat Ez Pickens (http://konahawaiifishingcharter.com/ez-pickens/) in the 57th Annual Hawaiian International Billfish Tournament. The recapture was approximately 15.6 miles (25.2 km) away from the original tag location. During that 7-day time period, the Blue Marlin most likely stayed in the pelagic waters just offshore of the southwest coast of Hawaii. The waters just off Hawaii, in particular southern coast, are ideal habitat due to the proximity of the continental shelf and abundance of mackerel, tuna, and squid which make up a substantial proportion of their diet. At the time of recapture, the Blue Marlin had an estimated total length of 86 inches (218.44 cm). After the tag information was recorded, the Blue Marlin was released healthy and unharmed. Pacific Blue Marlin (Makaira mazara) are a pelagic and migratory fish that is found in tropical and warm temperate oceanic waters around the world. They usually prefer waters warmer than 75°F (24°C). Blue Marlin are not normally seen near land masses or islands, unless there is a deep drop-off at the continental shelf (Example. Waters off Kailna-Kona, HI). Blue Marlin are characterized by an elongated body having dark blue dorsal color with silvery white color below. Sometimes they will exhibit light blue vertical stripes. The dorsal fin is high and pointed, with its greatest height is less than the greatest body depth. Blue Marlin primarily feed near the surface waters on mackerel, squid, and tunas, even big tunas such as Skipjack, Yellowfin, and Bigeye. It is also assumed that Blue Marlin use their bill during feeding, evidenced by slash marks on tunas from the stomach contents. Blue Marlin has a limited commercial value, with the majority of interest coming from Asian and Indo-Pacific cultures. They are most commonly caught as bycatch in tuna longline fisheries. Recreationally, Blue Marlin are considered the most sought after sportfish in the world. They are highly regarded due to the sizes they reach and their aggressive fight. Interesting Fact: That trophy grander Blue Marlin that everybody chases, is actually a female fish. Blue Marlin exhibit sexual dimorphism, meaning that females grow larger than males. Basically, there is a very high probability that any Blue Marlin over 110 inches (LJFL) is a female. 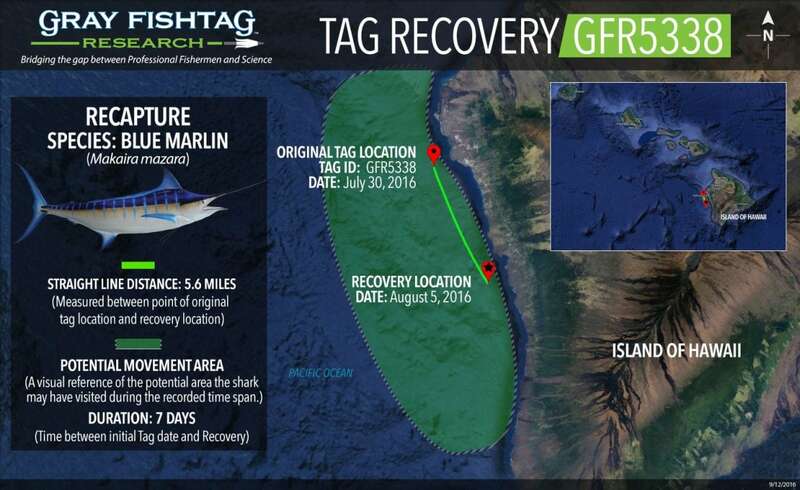 The Ohana charter boat crew will receive Gray FishTag gear for their tagging efforts. The tag recovery angler, Granger Wong Jr., will receive a pair of Costa Del Mar sunglasses, a Tag & Recovery Certificate, and Gray FishTag gear for reporting the tag recovery.